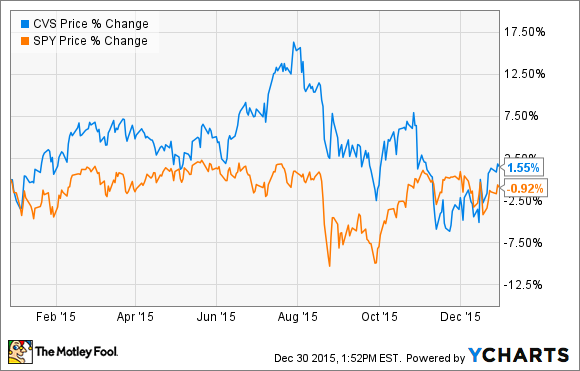 Will 2016 Be CVS Health's Best Year Yet? CVS Health has many growth drivers working in its favor, which leads me to believe that 2016 will be another prosperous year. This is shaping up to be a rather blah year for investors in retail giant CVS Health (NYSE:CVS). While the company provided its investors with a steady stream of good news throughout the year, its stock is currently on pace to end the year roughly where it began. It's hard to keep a good company's stock down for long, and the company initiated some big strategic moves in 2015 that should help to get shares moving in the right direction in the year ahead. CVS Health recently completed its $1.9 billion agreement to take over Target's (NYSE:TGT) pharmacy and clinic businesses. The deal brings 1,672 new pharmacies into CVS Health's vast empire, which will expand its retail footprint by more than 20%. The company is planning on rebranding all of these pharmacies under the CVS/Pharmacy name, and the 80 Target locations that include a medical clinic inside will take on its MinuteClinic name. The deal was just completed in December, so most of the transition will take place in 2016. The transition will also serve as a small tailwind in future years, as all new Target stores that house a pharmacy will be operated by CVS Health, including Target's smaller-format stores called TargetExpress. Customers are responding positively to the network of in-store clinics, and the company is rolling out new locations in its network as fast as it can. More than 1,000 of its retail pharmacies currently operate with a MinuteClinic inside, and management believes that there will be more than 1,500 up and running by 2017. Keep a close eye on this expansion in 2016. Earlier in 2015, CVS Health shelled out $12.9 billion to get its hands on Omnicare, a leading provider of pharmacy services to long-term-care facilities. CVS Health believes the long-term-care market is poised for strong growth in the coming years as the American population continues to age. This deal should allow the company to significantly expand its presence in both the assisted-living and long-term-care facility markets, and it also holds the potential to bring additional purchasing leverage with its suppliers. The company should also see a financial boost from this deal in 2016, as the deal is expected to boost its adjusted earnings per share by $0.20. Add these growth drivers together, and CVS Health's management team is feeling good about its prospects for 2016. It's currently guiding for the company's adjusted earnings per share to grow by at least 11.25% to between $5.73 and $5.88. If that estimate proves to be accurate, then CVS Health's stock is currently trading for less than 17 times its 2016 earnings. Management clearly sees value in its shares right now, with plans to repurchase $4 billion worth of stock in the coming year. Management is also looking to put more cash in shareholders' pockets, recently bumping up the dividend payment by 21%. Add it all up, and I think CVS Health's businesses -- and stock -- looks poised to prosper in 2016.